Jay’s brothers. | Scuffalong: Genealogy. Jay’s brothers. – Scuffalong: Genealogy. My grandmother: I had another cousin that died. A man named Jay. He was Aunt Elethea’s boy. She died when I was about 12 years old, I think. Anyway, she died, and she had three sons. Me: That was Jay and Charles and William. My grandmother, looking at a photo: Now, who is that? Me: That’s William, isn’t it? Elethea’s son? My grandmother: Ah, yeah. Yeah. Bill. 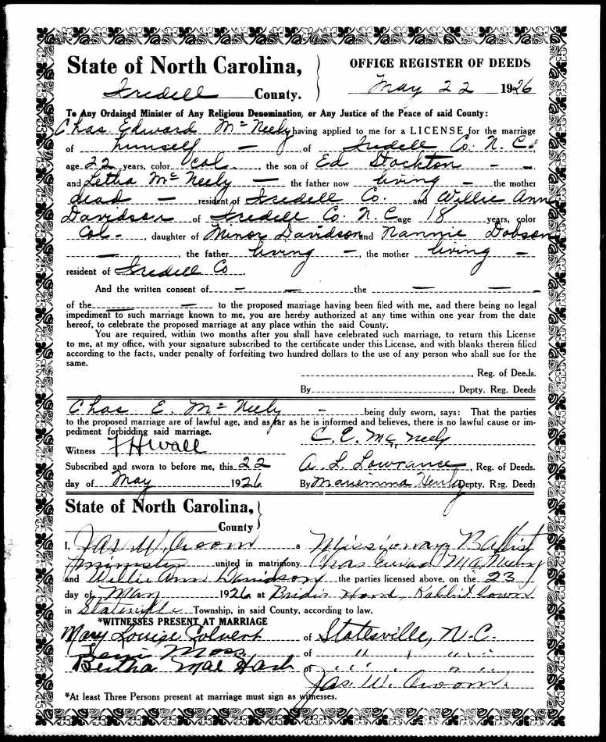 In 1942, Charles Edward McNeely filed for a delayed birth certificate in Iredell County. 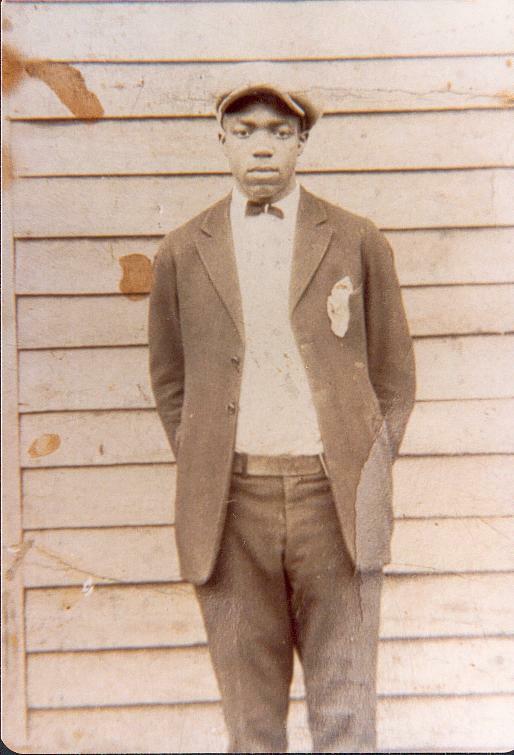 The document issued by the Register of Deeds reported that he was born 15 Jun 1904 to Eleather B. McNeely. No father is named. I have not found a birth certificate for Charles’ brother William “Bill” McNeely. On 23 May 1926, Charles Edward McNeely, 22, married Willie Ann Davidson, 18, before witnesses Mary Louise Colvert, Levi Moss and Bertha Mae Hart. Louise, my grandmother’s older sister, was his first cousin. Bertha was the half-sister of my grandmother’s father. Charles listed his parents as Ed Stockton (living) and Letha McNeely (dead.) John Edward Stockton (1881-1955) was born in Iredell County to Alfred and Caroline Kerr Stockton. He was working as a bellhop at the Hotel Iredell at the time of Charles’ birth. I don’t know whether he was also Bill McNeely’s father. Charles and Willie Ann’s marriage apparently did not take. In the 1930 census of Manhattan, New York County, New York, Charles M. McNeely, 26, and Willy M. McNeely, 22, were listed as boarders in household headed by Lucy R. Reid. Both were North Carolina-born and reported being married, though their wives were not enumerated with them. Charles worked as a machine operator in a mayonnaise factory and Willy as an elevator operator in a private house. In 1940, Charles McNeely was still in Manhattan, but I lose sight of Bill. Thirty-six year-old Charles lived at 308 W. 127th Street, a lodging house run by Lillie Collins. He gave his occupation as steamship laborer. On 29 September 1950, William and Charles McNeely are listed as nephews in the death notice of Edward McNeely of 454 Avenue C on September 28, 1950. Other survivors included wife Delphine (nee Peterson), sisters Emma Hauser [sic], Carrie Taylor and Minnie McNeely, nieces Ardeanur S. Hart and Lonnie [sic] Mae Jones, and nephews Henry and Erving Hauser [sic]. Charles McNeely, resident of north Harlem, died 1 Apr 1968. Four and a half months later, on 15 August, Bloomfield, New Jersey, resident William M. McNeely passed away. This William, however, was not Bill, but a son of William E. and Sarah L. McNeely. I have no evidence that either Charles or Bill had children. Interviews of Margaret C. Allen by Lisa Y. Henderson; photographs in the collection of Lisa Y. Henderson. ← Anna J. Henderson Simmons.